The redevelopment of Television Centre marks the latest transformation to London’s White City – an area of recurrent change and shifting identity. At the start of the 20th century it was unnamed and unmapped, but the 1908 Franco-British Exhibition and its ephemeral cityscape of white plaster facades earned this part of the W12 postcode its name. These pavilions are long gone, and the site is perhaps best-known for the BBC’s five-decade tenure. The corporation opened its purpose-built ‘home of British television’ in 1960, and remained there until 2013. The BBC has since returned in a much-reduced capacity, and the redeveloped building is predominantly home to luxury flats and members’ club Soho House’s latest outpost. The landscape may be dominated by nearby Westfield, but Television Centre is at the heart of White City’s £10bn regeneration and placemaking exercise, with the assertive tagline: ‘London’s new centre of gravity’. On the centre’s forecourt, between a branch of Chelsea institution Bluebird and the White City outpost of Soho House, is the third London restaurant of duo Will Bowlby and Rik Kampbell. 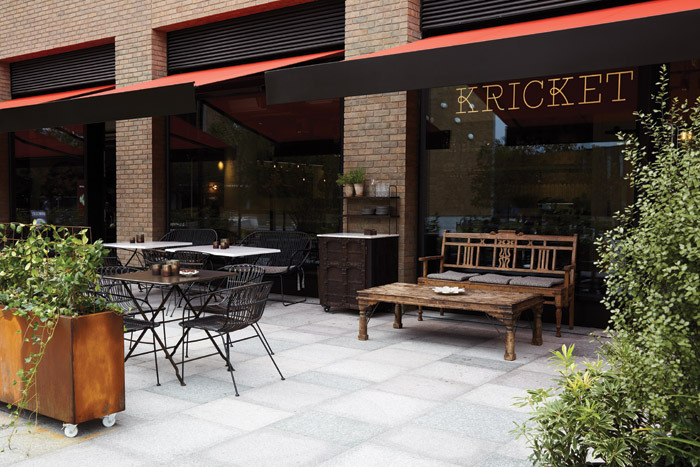 Inspired by the former’s experience in Mumbai kitchens, Kricket specialises in Indian small plates made with seasonal British ingredients. 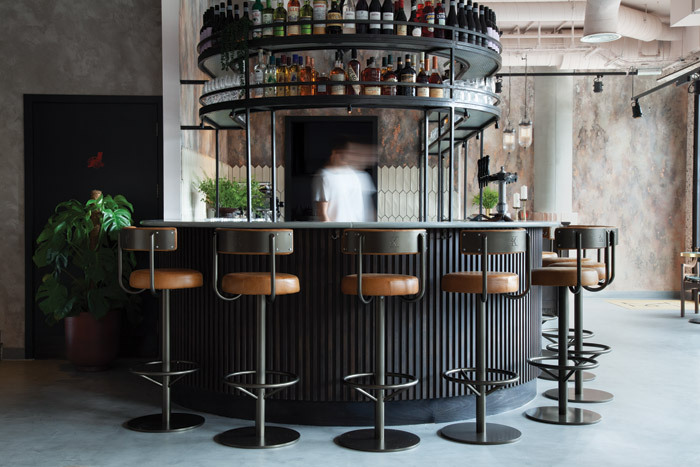 The restaurant interiors are designed by London-based design consultancy Run For The Hills as part of a long-standing collaboration that includes the design of Kricket’s creative identity, online presence, and cookbook. Kricket’s inaugural venture was opened in June 2015 in one of POP Brixton’s shipping containers, followed in January 2017 by a permanent Soho site. With space for 100 covers, the White City location is their most ambitious collaboration yet. The design reuses signature details from the earlier two restaurants, but has crafted a more polished identity for the west London location. The scale of the site and the presence of an outside terrace offered additional challenges to the designers. Alfresco dining comes with a view of the redeveloped television studios, but despite the historical building at the heart of the development, it was from a relatively uniform and uninspiring unit that Run For The Hills created the style and atmosphere of a Kricket restaurant. 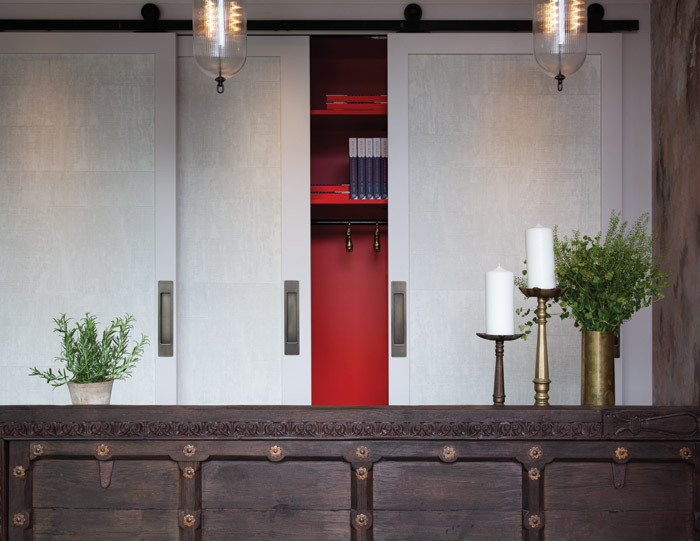 Design hallmarks include discreet pops of Kricket’s signature orange-red hue. The colour does not dominate – instead, a flash is seen when opening the cloakroom doors, while elsewhere it marks a looped Kricket ‘K’ and other custom hand-painted graphics provided by Run For The Hill’s team of sign writers. The palette is otherwise composed of earthy tones, while both textured surfaces and vintage furniture evoke a richness of the past. Surfaces appear weathered and worn – but worn smooth and soft-looking to touch – with polished plaster and sumptuous leather-covered stools. More familiar vintage and industrial items sit alongside bespoke products and furniture made of unprocessed raw materials, whose natural variations make them somewhat one of a kind. 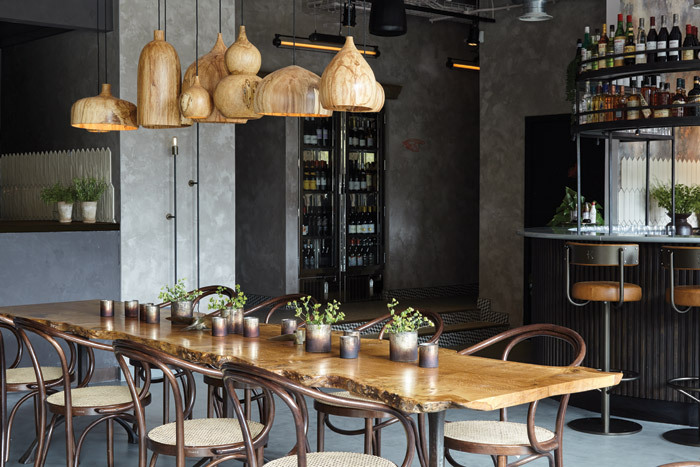 A notable example – and elegant focal point of the interior – is the series of hand turned wooden pendant lights by Tamasine Osher that form a crowd of idiosyncratic silhouettes above a communal table. From naturally fallen spalted beech, they are sustainably sourced; their unique patterns were formed by fungi growing on the fallen wood over two or three years. Furniture frequently contrasts dark with light: dark wooden dining chairs have woven cane seats (a reference to the decor of Colonial-era Mumbai); elsewhere the dark brown timber of the horseshoe bar is topped with the same Lavastone Pyrolave as in the Soho branch, (this time in mint green) and smaller tables are topped with green Verde Rajistan and brown Emperador marbles, or white carrera. A curved counter seats 18 for dinner overlooking an open part of the kitchen, whereas further communal seating is provided by the large sharing table. For more private dining there are small round tables, and rattanwork two-seater booths, similar again to the Soho restaurant. In the bathroom, the contrast of heavy metalwork with pale surfaces continues, but with more opulence than an aesthetic of industrial minimalism. 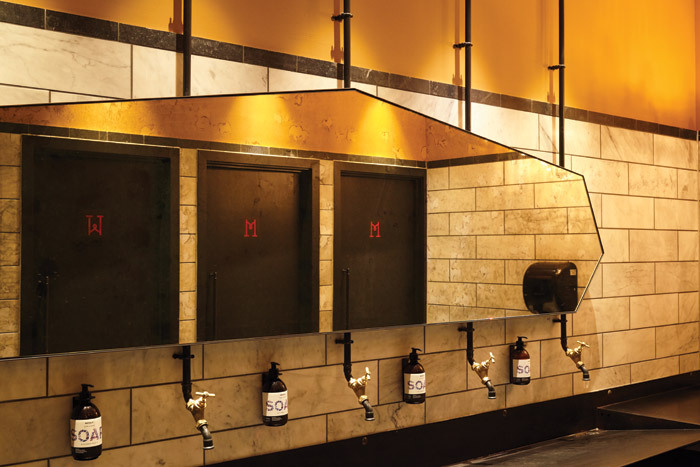 The large communal sink is a blackened steel trough, mirrors are framed with iron, and taps are industrial pipework, but the taps have a gold finish, the wall tiles are marble, and chandeliers hang from the ceiling. Reproducing the DNA of a brand in a new development can be a challenge, but with an attention to detail Run For The Hills manages to establish a real sense of place. The design is unusually rich in competing textures, yet each holds its own in the space. Rather than confusing the vision, this prevents a themepark cohesion that would fail to ring true. Referencing a history of competing legacies, it instead it tells a story: Run For The Hills has managed to distil the flavours of Mumbai with the industrial beginnings of Kricket’s shipping container start. In the palimpsest landscape of White City, Kricket’s new restaurant offers a welcoming introduction to its first-time visitors, as well as a space where Kricket’s existing fans will feel equally at home.